On Romanian Language Day, my host mother “prepared something special for dinner” for me: cooked pork tongue. Eating it, she told me, would help me speak the language better. The linguistic magic of eating liver. After all, in Romanian, the word “limba” means both tongue and language. Learning a new language has always been a challenge for me. Here in northern Moldova, where I recently began working as a health education volunteer, it’s been one of the most daunting and frustrating parts of my service. Not being able to fully communicate my basic needs, let alone ideas and opinions, has been humbling. The experience has also taught me patience. I’ve never been good with patience, as my host mother has seen whenever I try to speak beyond the basics. On August 31, the day before school began, we celebrated Romanian Language Day. Members of our community performed dances, poems, songs and speeches to celebrate Moldova’s historical language and the freedom for people to use it. She understood, though, and the next day we went to the market and bought supplies to try making this at home. Using my broken Romanian and lots of miming, I then showed her how we prepare and cook everything. When our veggie pizzas came out of the oven, my first taste sent me whirling back home to my own kitchen, cooking dinner with my family. Her first taste elicited a smile and a quick “gustos,” or “delicious,” followed by eating a second piece. After a few minutes she looked at me and told me she would make veggie pizzas for the students at school. The pizzas are not only healthy, she said, but the kids will like them, too. Our first batch of veggie pizzas lasted for another few meals before they were gone. As we ate them, my host mom described her history serving food as a public health nurse, explaining how she was in charge of all the school nutrition programs within our district. As I watched her in the evenings, calculating the grams of every food item, for every meal, for every student, I believed her when she said she’d been first in her statistics class. I’m not sure whether the pork tongue will help me speak Romanian faster, although I am understanding more every day. 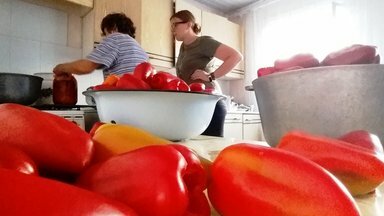 There’s no doubt, though, that the language of food and the sharing of recipes has become an important part of our shared experience, as it is for so many other Peace Corps Volunteers around the world. No matter what their meal, be it tongue or veggie pizzas, people come together over food and join in a common conversation. Cut off both ends of the eggplant. Cut it into 3/4 inch slices. Sprinkle both sides with salt to draw out the liquid. Let slices sit 15 minutes. Preheat oven to 375F/190C. Spread oil over a baking pan. Lay eggplant slices on pan and brush them with a little oil. Sprinkle on chopped garlic. 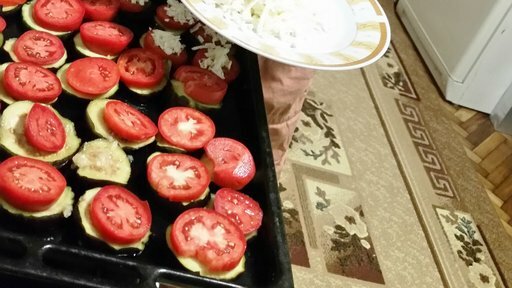 Slice the tomatoes and place them on top of the garlic-covered eggplant slices. Top generously with cheese. Place the pizzas in the hot oven until the cheese starts to melt. Some cheeses, like brinza, don’t melt well, so just wait until the cheese looks soft, the oil is bubbling and the ends of the eggplant slices start curling in. 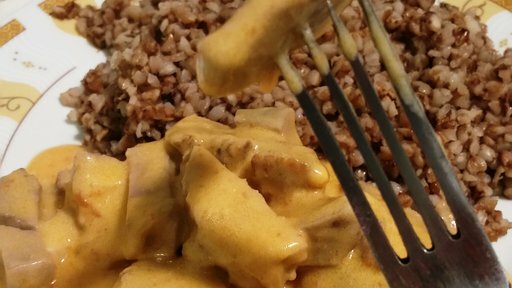 Test the eggplant’s softness with a fork. If the fork slides in easily, your pizzas are done. Serve hot. Kaylin Stinski, from Colorado, is a Health Education Volunteer in northern Moldova.